Ella Rhodes reports from a Behavioural Science and Public Health Network event. Since its creation five years ago the Behavioural Science and Public Health Network has been bridging the gap between academia and population health. The network was involved in the creation of Public Health England’s first-ever national strategy on behavioural science, and recently held its fourth annual conference to discuss progress and directions for future travel. After a welcome by outgoing Chair Dr Angel Chater (University of Bedfordshire), Professor Chris Armitage (University of Manchester) spoke of the difficulties of combining the often slower world of academia with questions in public health – which often require much speedier answers. He gave the example of his own study into improving the oral health of children using implementation intentions – or ‘if-then plans’. While the theory behind this approach was first put forward in 1990, there were no published studies on the technique until 1997. Similarly, while Armitage was awarded funding from the NiHR 2014 for his oral health study, it was not completed until last year, and now needs to be extended in a further trial. One approach to speeding up the application of behavioural science to public health approaches is the Behavioural Science Consortium, a framework agreement with the government via a contract with Crown Commercial Services which brings together six suppliers of behavioural insights research driven by the Cabinet Office. Armitage and colleagues at the University of Manchester and Sheffield Hallam University have come together as one of these suppliers, and can bid for tenders from various government organisations. The London Borough of Southwark contains some of the most deprived, and most affluent, areas of the capital which presents fascinating challenges for public health professionals. An Epidemiologist by background, Professor Kevin Fenton moved from Public Health England to a secondment position as Director of Place and Wellbeing at Southwark Council in 2017. He began by taking stock of the challenges in the borough, including a gap between the healthy life expectancy and educational attainment of those in more affluent compared with more deprived areas. Fenton used the Health in All Policies Approach, which suggests considering health implications when making decisions, and among other initiatives introduced free swimming and gym use for all Southwark residents at certain times, trained some council staff as mental health first-aiders and introduced free healthy school meals for all primary school children. After a year Fenton created the Place and Wellbeing Department in the council. This aims to, among other things, ensure regeneration works for everyone, address inequalities, and create a sense of pride in the borough. 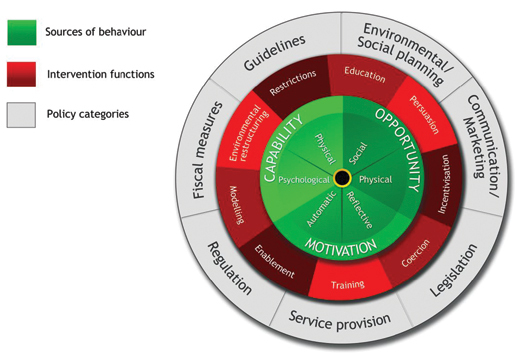 The Behaviour Change Wheel, created by Professors Susan Michie and Robert West (UCL), is an interdisciplinary framework for developing behaviour change interventions. However some have asked how the wheel can work in tandem with other approaches, for example MINDSPACE and EAST, which are often used by government organisations in designing and implementing behaviour change interventions. In an attempt to encapsulate all the approaches in the three models, West told the audience, he and Michie have developed NEAR-AFAR. This provides a simple framework for applying the behaviour change wheel to policies and interventions. The ‘NEAR’ part of the model promotes certain behaviours: ‘Normal’, the fact we do things which other people are doing or that which we think they’re doing; ‘Easy’, or increasing the capability of people to carry out a certain behaviour; ‘Attractive’, making a behaviour seem more pleasant; and ‘Routine’, making a behaviour as automatic as possible. ‘AFAR’ intends to prevent a behaviour: ‘Abnormal’, making a behaviour seem unusual, ‘Fraught’, or less easy to do; ‘Appalling’, people are less likely to do something they expect will be unpleasant; and ‘Reflect’, West said people are less likely to be habitual in their behaviour if the routine can be disrupted. Much of West and Michie’s work is freely available online for those interested in structuring behaviour change interventions, see unlockingbehaviourchange.com and behaviourchangewheel.com for more information.